Our little Bella, turning seven years old! There are two surprising things about this picture. 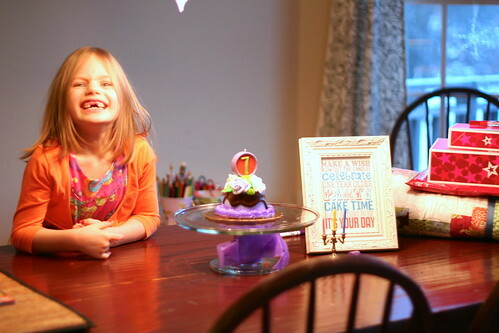 First, Bella lost her wiggly front tooth at school! On her birthday! Oh yes she did!! And second, that is a bakery cake, as requested. Oh yes she did. Bella's presents include American Girl loot and a quilt that is really almost nearly quite finished. I can't remember why Mimi looks like that in this picture. But I'm going to guess it is because IT IS NOT HER BIRTHDAY. We love birthday parties around here! 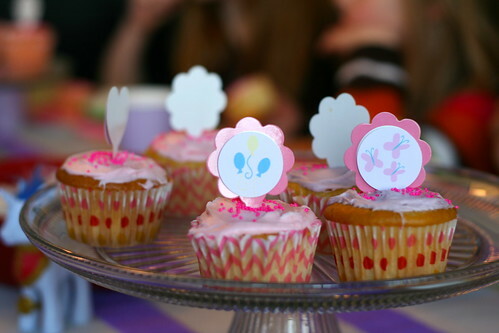 We had a lot of fun planning a My Little Pony party for a bunch of little friends. 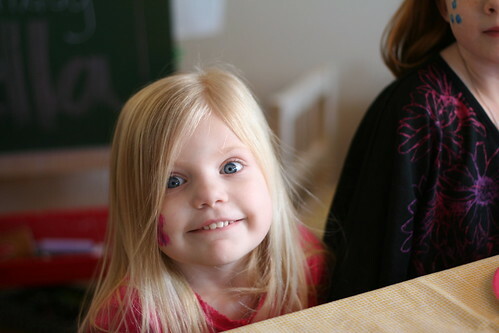 Here is Mimi, excited to be at the big girl table! We served cupcakes and ice cream. I even remembered to pre-scoop the ice cream into muffin papers, a fairly brilliant idea that I never think of the night before. The house is decorated with ponies ponies ponies everywhere. 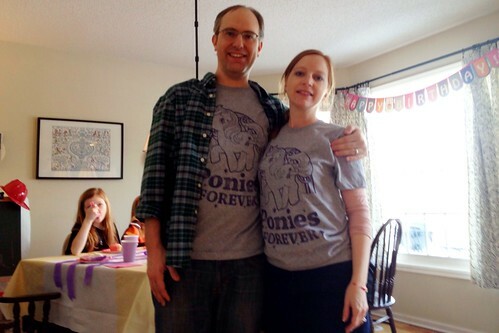 And of course my little Brony was a wonderful dad in every way, and even dressed the part. 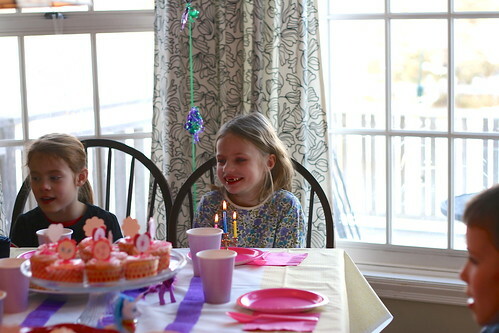 The party was followed by the absolute highlight of a seven-year-old's entire existence. 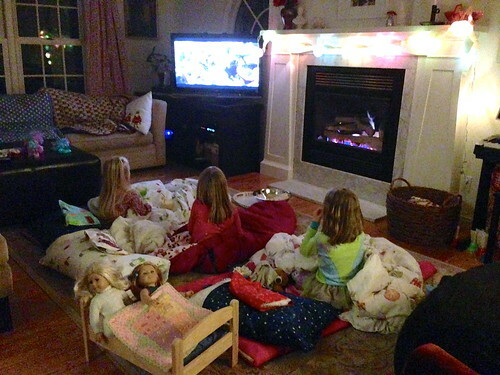 A SLEEPOVER! Cousin CC stayed after the party and we made pancakes for dinner, found the ponies about a hundred more times, watched a movie with popcorn, had a pillow fight, and eventually fell asleep. It was everything Bella dreamed it would be. 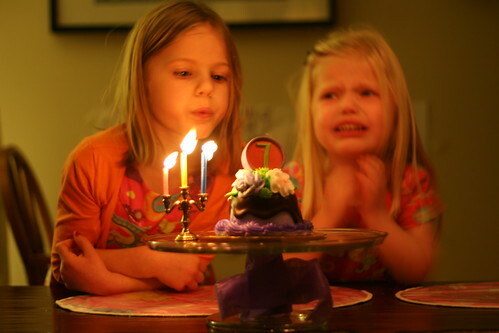 Which is exactly how your seventh birthday should end. Happy Birthday to my Beautiful Bella!